Our partnership is committed to developing a learning culture and community where social work students are supported to develop their capabilities and confidence to practice. Therefore we are supporting qualified social workers to develop their practice education skills to ensure students have a high quality learning experience in practice. We are committed to ensuring that staff involved in practice education are well supported and valued and recognise the demands of undertaking these roles alongside your day job. We take a partnership approach towards Practice Education training and supporting organisations and individual teams to develop the skills and knowledge to effectively supervise and train students. Read our guide to learn more about the different roles and the training and support available to placement providers. Both our university partners offer stage one (PE1) and stage two (PE2) Practice Educator training. 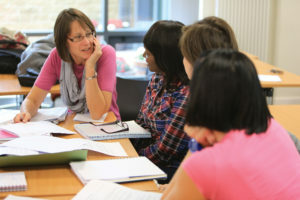 Courses are delivered at various points throughout the year. They will equip you with the knowledge, skills and approaches necessary to best support undergraduate and postgraduate social work students. 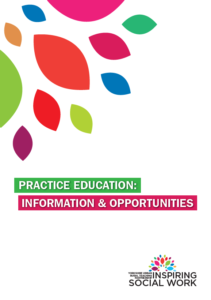 For information on courses available and booking procedures please see the CPD Brochure. We are continually developing our ongoing programme of support for staff across the partnership who undertake a Practice Education Role. Leading the way are our Practice Educator Consultants who are key to implementing our vision. In addition please keep checking our Events page for details of upcoming masterclasses and conferences. Find out more about all continuous professional development opportunities available to our Social Workers.